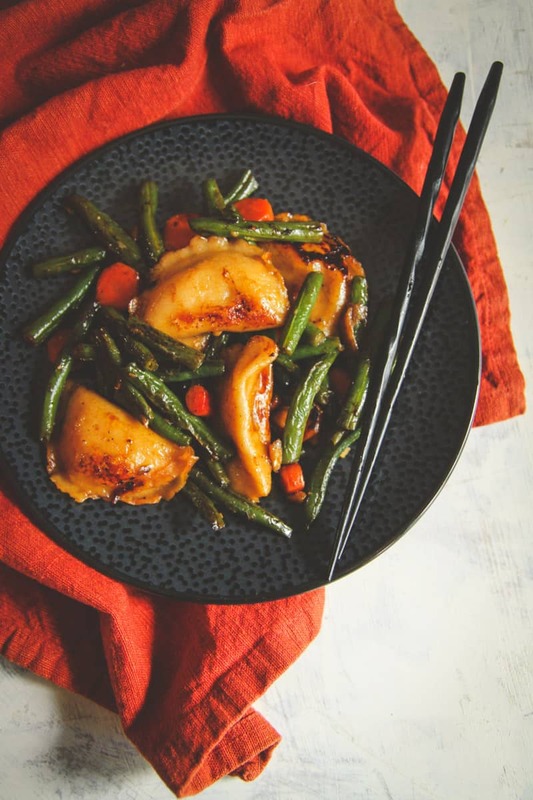 This one pan vegetarian dumpling stir fry recipe is the perfect dish to make when you’re short on time and want an incredibly delicious dinner on the table in less than 30 minutes! Whenever I go to an Asian food restaurant and they have dumplings or potsickers on the menu, I always order them. 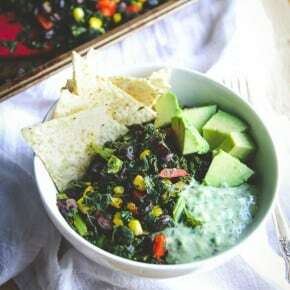 They’re just so yummy and I love dipping them in the sauce that comes with them. However, I always feel bad for my vegetarian friends (or sister who is vegetarian) who cannot enjoy them, because they’re always filled with meat. Well, I just discovered the most amazing vegetarian dumplings ever! 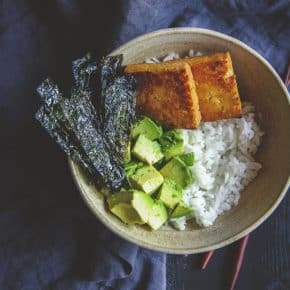 As I was buying tofu to make my 5 ingredient vegetarian sushi bowls (a quick lunch I make ALL the time) these tofu dumplings caught my eye. When I picked them up, I was not surprised that they are made by my favorite tofu product company: Nasoya Tofu. 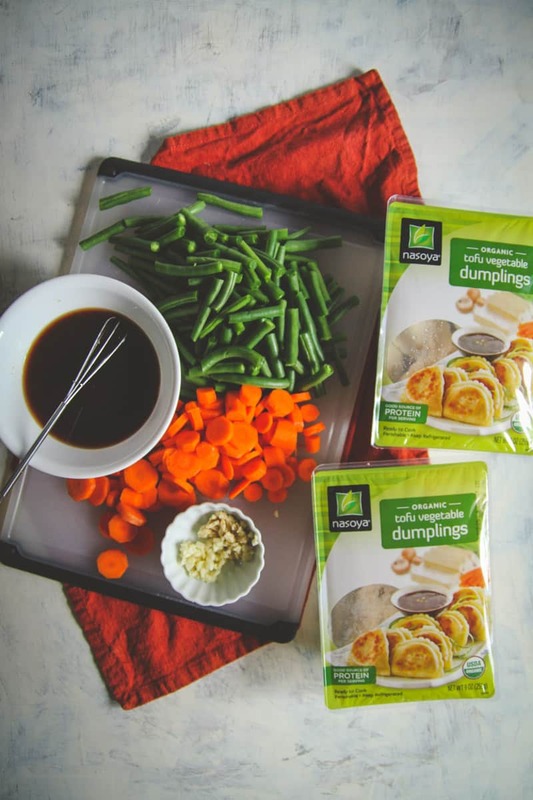 I got them to try, and you guys: these vegetarian tofu dumplings are incredible! Seriously, the first time I made them I just cooked them in a pan with a little oil and then dipped them in some soy sauce. And that’s it – I ate that as an entire meal. They’re addictively good! 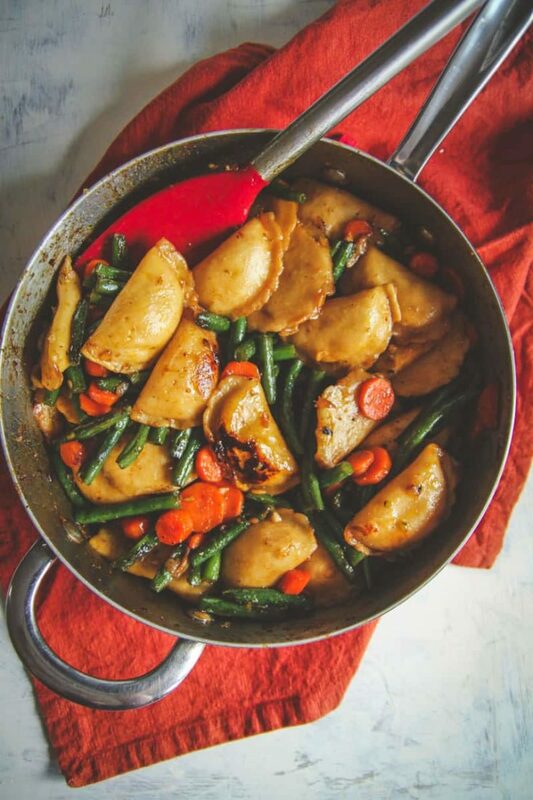 I like to have at least one meatless day a week, so when I was making my meal plan; I knew I had to include a dish that included these dumplings. So I combined the dumplings with a stir fry and oh my goodness, it turned into one of my now all-time favorite vegetarian recipes. This one pan vegetarian dumpling stir fry comes together in a flash. 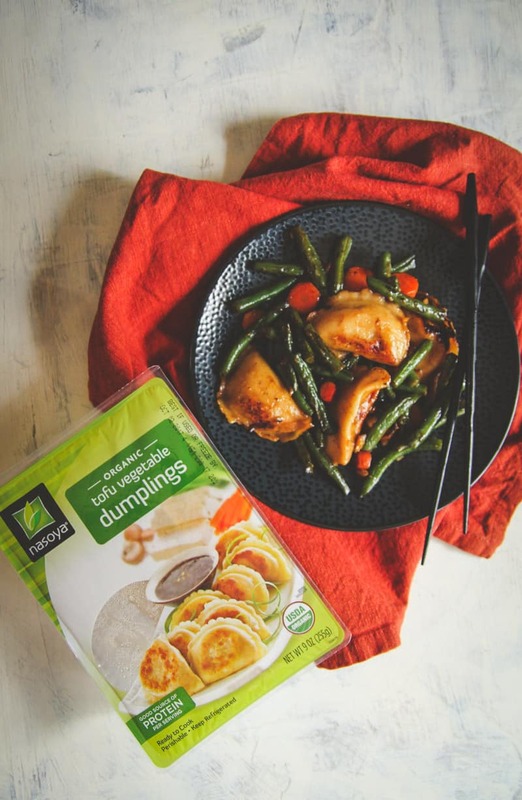 All you do is cook some green beans and carrots in a pan, add in the dumplings and a stir fry sauce and in under 30 minutes you have yourself a delicious dinner. Best of all, cleanup is a breeze because everything cooks in one pan – and it’s not one of those things where you take ingredients out of the dish to rest while you cook something else in the pan and then add it back. 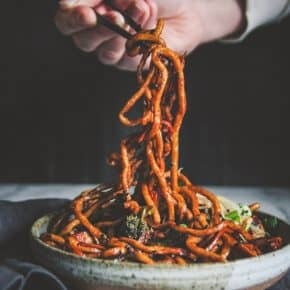 Nope, it’s all in one pan, you add ingredients as you go. 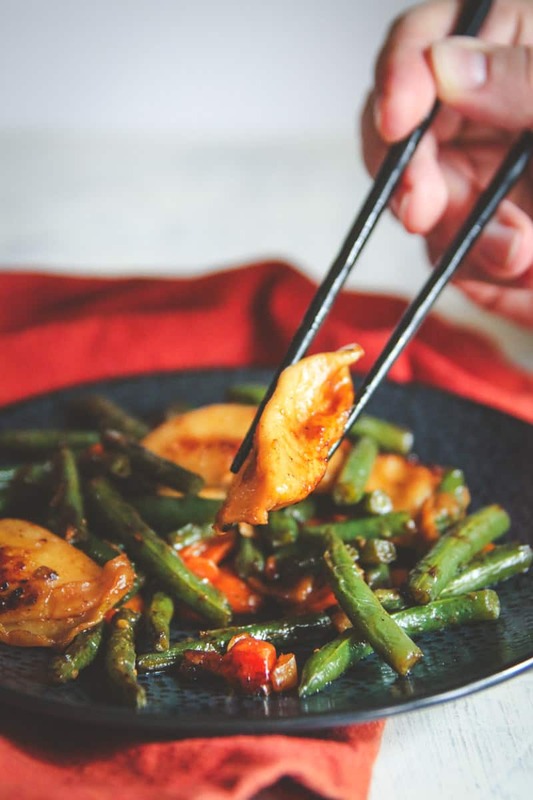 So the next time you’re in need of an amazing vegetarian dish, I’d highly recommend this one pan dumpling stir fry, you’ll thank me after making it! 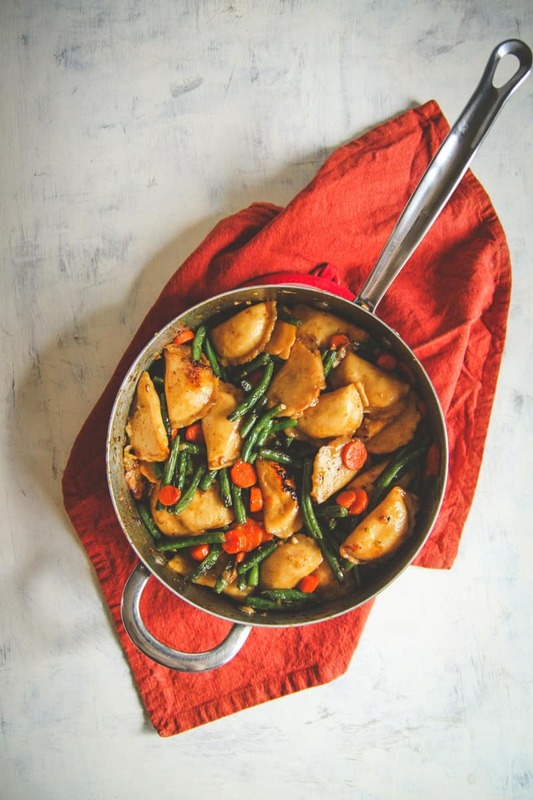 When the green beans and carrots have become tender, remove lid, and add garlic, ginger, and the dumplings to the pan, sprinkle in a pinch of salt. Cook for 1-2 minutes, until the dumplings become a little brown, and then add the sauce into the pan. Cook for 2 minutes, until the sauce has coated the dumplings and vegetables and has reduced a bit. Remove from heat, let rest a few minutes, then serve and enjoy! These look SO perfectly cooked! 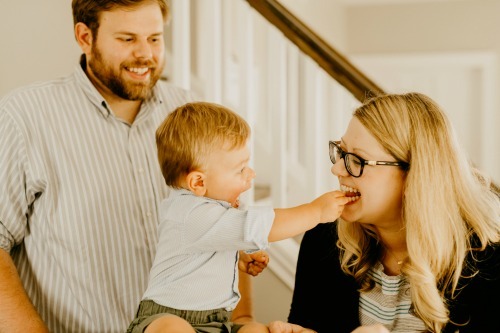 And I love that you made a full meal out of the dumplings… Yum!